Radiators | Bathroom Takeaway 5% discount? Our extensive range of radiators will keep your bathroom warm and cosy at all times and provide guests with a real sense of style. Whether you are looking for a traditional feel or a contemporary look, we have many designs and sizes to choose from. Our towel radiators are also available in different finishes to suit your needs perfectly, including options for smaller spaces where heat is still required. 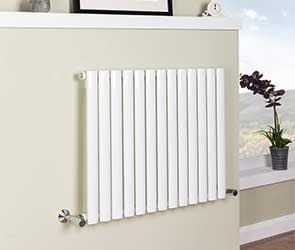 Quality matters to us and all our towel rail radiators come with a 10 year 'Fit and Forget' guarantee. Cosy has never looked so good. ###H2###Bathroom Radiators###/H2######BR### There aren’t many things worse than getting out of the shower or bath into a cold room. That’s why here at Bathroom Takeaway we think a radiator is the perfect accessory and finishing touch for your bathroom. Not only are they extremely practical and keep your bathroom warm and cosy, no matter the weather outside, designer radiators are perfect if you want to add some style to your space. Offering enough heat to warm an entire room, they are perfect for a big family bathroom. Where space may be a problem, we have a large range of heated towel rails or smaller radiators. ###BR######BR### At Bathroom Takeaway our range of radiators extends from traditional to contemporary depending on the style of your bathroom and vertical or horizontal dependent on whether you need to save space. 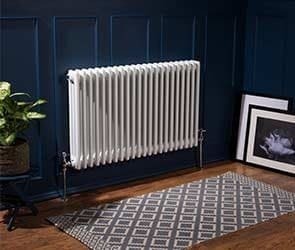 Designed to fit perfectly with any style bathroom, and bring a sense of elegance to your space, we have a range of sizes and colours, so you are sure to find the perfect radiator for your room. ###BR######BR### We are so confident in the quality of our bathroom radiators that we offer a full 10 year ‘Fit & Forget’ guarantee, so you know your products are built to last and will maintain their high quality for years to come. 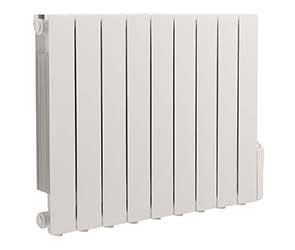 ###BR######BR### ###H3###Central heating or oil filled radiator###/H3### At Bathroom Takeaway, our main range of radiators are water filled and connect to the central heating, so will use the energy supply from here to heat up your room. This is an extremely energy efficient way to heat your bathroom and probably the most popular. Our bathroom radiators are produced from the highest quality materials, to ensure your product is as efficient as possible. 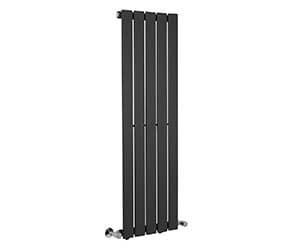 ###BR######BR### As well as central heating radiators, we stock a range of oil filled electric radiators. Oil filled radiators heat up by using a heating element that is immersed in oil, spreading heat evenly throughout the radiator. Instead of using the energy from your central heating, these standalone products are self-sufficient and heat up using their own supply. This allows you to still heat your bathroom in the summer, even when you don’t need the central heating system on to heat the whole house. 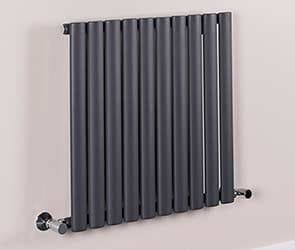 Oil-filled radiators are regarded for their cost and energy efficiency, making them a popular choice for those replacing their bathroom radiator. ###BR######BR### ###H3###Choosing a heat output###/H3### It is important when choosing your bathroom radiator to decide on the most suitable heat output for your room. You need to ensure that the radiator you want is fit for purpose. If you are trying to heat a large, family sized bathroom, it is recommended you choose a radiator with a high heat output. ###BR######BR### The BTU of each of our radiators can be found in the Features & Benefits section of each of our products. 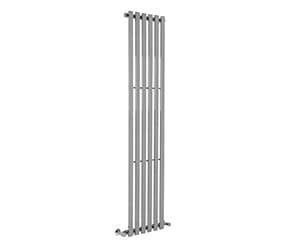 ###BR######BR### If you want extra heat in your bathroom or you aren’t receiving a sufficient heat supply from your bathroom radiator, we also have a range of slimline heated towel rails, that you can use to provide your bathroom with an extra boost of heat. With a range of electric towel rails and heating elements, you can buy a small towel rail that is self-sufficient and only uses heat when you specify. ###BR######BR### All of our radiators have been designed with energy efficiency, functionality and style in mind. So, you can be sure you are receiving the best product for your money. ###BR######BR### ###H3###Choosing a style of radiator###/H3### With so much choice on the market, choosing a style of radiator can be difficult. Dependent on the design of your bathroom, we have a range of classically designed radiators, perfect for any traditional style bathroom. Inspired by the Victorian era, these bathroom radiators add a stunning period design to your bathroom suite, really adding to the full design. Available as either horizontal or vertical column bathroom radiators, they are suitable for any traditional style bathroom, no matter the size. ###BR######BR### For a more contemporary bathroom suite, we offer a range of designer radiators, in either chrome, white or grey. The wide range of sizes and colours means our radiators will fit with any style or size bathroom, no matter the colour scheme and can either fit seamlessly with the rest of your bathroom suite or become a striking wall feature. ###BR######BR### Horizontal radiators are extremely popular in modern bathrooms, thanks to their streamlined, contemporary design. Following the lines of the wall, they have a certain minimalistic feature that makes them ideal for a contemporary, clutter free bathroom suite. Horizontal radiators are also the ideal choice for a smaller bathroom or cloakroom, thanks to their space saving abilities. ###BR######BR### Our radiators come with fixing packs, complete with plugs and vents, supplying you with everything you need. It is important to note that we advise you to seek the skills of a professional plumber when installing these items. 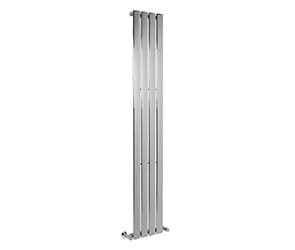 ###BR######BR### ###H3###Radiator Accessories###/H3### Not only do we sell a wide range of bathroom radiators, Bathroom Takeaway also offers radiator accessories such as thermostatic valves and heating elements. Heating elements are great if you wish to turn your radiator into dual fuel, however it is important that you seek the skills of a qualified plumber to do this for you. ###BR######BR### Thermostatic radiator valves are also an important feature of a bathroom radiator and provide you with more control over the temperature and heat output. There to help increase the cost-efficiency of your radiator, our range of thermostatic valves fit seamlessly with your radiator and really finish the look off. ###BR######BR### ###H3###Quality Assurance###/H3### All of our radiators have to undertake stringent safety checks, in order to ensure they are compliant with health and safety regulations. All of our radiators are also certified up to BS EN 442 and pressure tested to ensure maximum safety. Manufactured using the highest quality products, with functionality and style in mind, you can be sure you are receiving the highest quality products available on the market. We are so confident that you will love your products, we offer a 30-day money back guarantee and a 10 year ‘Fit & Forget’ guarantee. ###BR######BR### Additionally, Bathroom Takeaway offer an everyday price promise, so you can be sure you are receiving the best product for the best price, without having to wait for seasonal sales.